For a historical start to the year 2015, Ballet BC decided to host Miami City Ballet for its Vancouver debut this February. The performance, entitled Balanchine, boasted an ambitious programme: three exceptionally distinct works by the late choreographic genius and father of contemporary ballet, George Balanchine, a man whose “repertoire…shapes [this company’s] identity,” according to Miami City Ballet’s artistic director, Lourdes Lopez. The evening promised excellence, and the dancers most definitely delivered. Each work demonstrated both Balanchine’s choreographic diversity and innovation, in addition to showcasing the company members’ talent and versatility. Whether it was through the fast-paced virtuosity of “Ballo della Regina,” the precise and angular movements of “Symphony in Three Movements,” or the breathtaking grace and simplicity of “Serenade,” the Miami City Ballet certainly made a memorable first impression on its Vancouver audiences. Daniel Azoulay. Miami City Ballet Dancers in “Ballo della Regina,” 2015. Digital image. Courtesy of Vancity Buzz website. Before the performance even started, the audience was already buzzing with anticipation and high expectations. But the theatre fell silent as the lights faded and the curtain rose with the swell of Giuseppe Verdi’s opening bars, to reveal a scene of twelve females in blue bodysuits and short, flowing skirts, frozen in a staggered semi-circle with their arms and gaze focusing into the distance. Behind them, a simple backdrop with a projection of pale orange and pink depicted the beginning of a sunrise, which would grow into a beautiful open sky throughout the piece. “Ballo della Regina” was an excellent choice for the night’s opening number; inspired by the tale of a fisherman searching for the perfect pearl, Verdi’s powerful music combined with Balanchine’s layered choreography and intricate footwork kept the audience on their toes…so to speak. Probably the most classical work of the programme, “Ballo della Regina” invoked images of the sea through its dancers’ constantly shifting formations and sweeping arm and leg movements, often done in canon, conjuring images of ocean waves. The incredibly quick and light turns and jumps en pointe of the principal ballerina, Nathalia Arja, were reminiscent of Don Quixote’s “Cupid” variation and the “Canary Fairy” from Sleeping Beauty, multiplied tenfold; I could find no better way to describe her than as effervescent. In contrast with the male principal, Kleber Rebello, whose smooth and fluid turns and leaps were interspersed with his partner’s rapid movements, gave the impression that he played the role of the tide, while she was the sea foam. Following the first intermission, several impatient audience members returned to their seats for “Symphony in Three Movements”. A piece that diverged immensely from the previous work’s wavelike motifs and swooping movements, the evening’s second piece involved precise, linear movements and jazz-like quality. Set to Igor Stravinsky’s score of the same title, against a plain black backdrop, the dancers’ controlled, angular movements presented a stark contrast against Stravinsky’s wild, occasionally chaotic composition. The female dancers’ belted bodysuits (white on the fourteen corps members, black on the four soloists, and different shades of pink on the three principals) and quick, turned-in kicks and walks contributed to the jazz-like quality of the work, while the male dancers’ leaps and strong upper-body postures paired with the score’s conflicting chords evoked almost automatic comparisons to the Sharks and Jets of West Side Story. This piece was a fast-paced work of angular positions, precise pas de deux, and complex weaving from one intricate formation to another. Of course, the piece that was most anticipated, George Balanchine’s most iconic work, was chosen as the night’s finale. Balanchine’s “Serenade” was the first work Balanchine created in America, and is an example of choreographic simplicity at its finest. The piece was introduced with seventeen females in long, blue tulle skirts, standing with their feet parallel, in two adjacent diamonds, looking up at their extended arm. The simplicity of the work’s beginning, consisting only of single, slow arm movements, was demonstrative of the fact that choreography doesn’t need to be complex to captivate the audience. As the dancers began to move with more virtuosity, they smoothly leapt and spun in and out of fascinating formations, finally moving into a lively circle punctuated with full, sweeping movements. Eventually, the dancers exited to leave one girl onstage, lying with her hair down and her head in her arms. After a male dancer arrived to help her rise and partner in an intimate pas de deux, they began to dance with a second female dancer, in a dance that consisted of slow, intertwining poses that depicted the male’s choice between the two women. One pose that was quite striking resembled a familiar image of a fallen individual, reaching up to her guardian angel; the male dancer gazed down upon the collapsed woman, while the second female stood hidden behind him with her arms forming wing-like shapes that appeared to sprout from his back. The final image provoked an intense emotional response from the audience, as the group of male and female dancers lifted the woman from the ground to stand upright, held by her legs, as the group slowly walked her upstage across the dark stage, towards an almost heavenly light. Daniel Azoulay. Miami City Ballet Dancers in “Symphony in Three Movements,” 2015. Digital image. Courtesy of Vancity Buzz website. As a full-length programme, Balanchine was extremely satisfying to watch. “Ballo della Regina” was beautiful, lively, and enthusiastically received by the audience; the principal dancers were dazzling, the soloists dynamic, and the members of the corps graceful and supportive of the piece as a whole. In comparison to the first and last works, “Symphony in Three Movements” was slightly less intriguing; to be honest, I may have become distracted for a minute or so in the middle of the piece. However, the unique positions and quirky movements deserved much appreciation, and were still interesting enough to hold my attention for the majority of the work. The intensity and grace of “Serenade” had such an emotional effect, that, although the piece was plotless, the audience could still find meaning within the choreography and be greatly moved. It was by far the audience’s most preferred work of the evening, and resulted in an enthusiastic standing ovation. 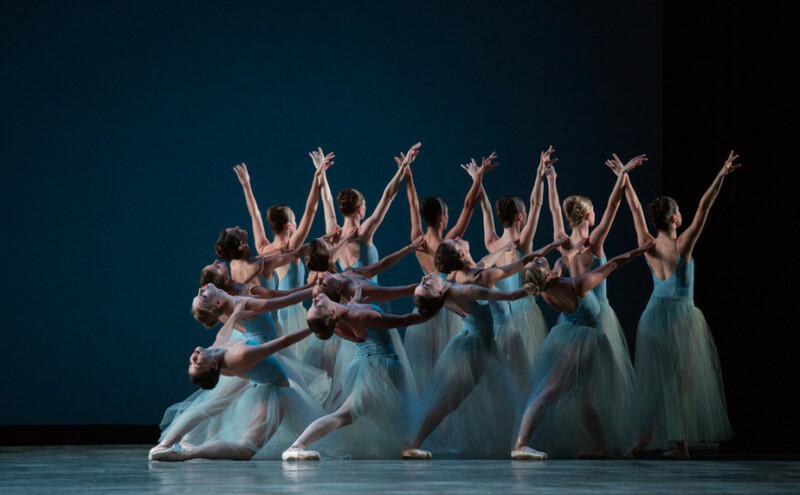 Miami City Ballet’s rendition of George Balanchine’s choreography produced performances that were technically stunning and emotionally riveting. These works showed glimpses into the choreography that Balanchine would influence in other artists long after he was gone, and the audience’s passionate response after the finale proved that his work is timeless and still relevant to the development of the performing arts today. Daniel Azoulay. Miami City Ballet Dancers in “Serenade,” 2015. Digital image. Courtesy of Lords of Dogwood website.